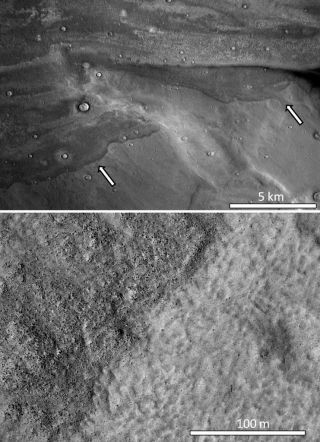 These visible-light views of Mars show lobe-like deposits probably caused by tsunamis (top image) and the bouldery material the huge wave deposited (bottom image). Traces of tsunamis on Mars are the newest clues yet that the Red Planet once had oceans, which could have supported life, researchers said. These killer waves might have been triggered by giant meteor impacts, scientists added. Although the surface of Mars is now cold and dry, there is a great deal of evidence suggesting that an ocean's worth of water covered the Red Planet billions of years ago. Since life is found on Earth virtually wherever there is liquid water, some researchers have suggested that life might have evolved on Mars when the planet was wet. Life could survive there even now, hidden underground, some scientists have said. But new thermal images of the northern plains of Mars reveal what may be ancient scars left by two mega tsunamis about 3.4 billion years ago, researchers said. That was back when the Red Planet may have possessed a cold, salty, icy ocean. "Our work provides definitive evidence for the presence of large and long-lived oceans on Mars," study co-author Alberto Fairén, a planetary scientist at the Center of Astrobiology in Madrid and Cornell University in New York, told Space.com. The scientists examined ancient Martian shorelines for anomalies and discovered lobes modifying portions of these coasts. "Lobes are curved, roundish projections formed by deposits of sediments," Fairén said. These objects are huge, reaching up to hundreds of miles long and wide, said study lead author Alexis Rodriguez, a planetary scientist at the Planetary Science Institute in Tucson, Arizona. Similar but smaller lobes are seen on Earth after catastrophic waves. The researchers suggested that the Martian lobes were caused by two giant tsunamis, which extended over a wide range of elevations, from gently sloping plains to cratered highlands. The older tsunami inundated an area about 309,000 square miles (800,000 square kilometers) in size, while the younger one drowned a region about 386,000 square miles (1 million sq. km) large, the researchers said. The older tsunami dragged boulders up to about 33 feet (10 meters) large along with it. As gravity rapidly pulled water from the wave back to where it came from, the water carved numerous channels ranging between up to about 655 feet (200 m) wide and about 12.4 miles (20 km) long. Similar channels are seen from the backwash of tsunamis on Earth, the researchers said. In the time between the older and younger tsunami, the researchers said, the Martian climate apparently became significantly colder, since the second tsunami's lobes were rich in ice. "These lobes froze on the land as they reached their maximum extent, and the ice never went back to the ocean, which implies the ocean was at least partially frozen at that time," Fairén said in a statement. Left: Color-coded digital elevation model of the study area showing the two proposed shoreline levels of an early Mars ocean that existed about 3.4 billion years ago. Right: Areas covered by the documented tsunami events extending from these shorelines. The scientists suggested that these two mega tsunamis were caused by two meteor strikes. The researchers' calculations estimated that such cosmic impacts would have generated craters about 18 miles (30 km) wide and triggered tsunamis with onshore heights of about 165 feet (50 m). Previous research suggested that about 3.4 billion years ago, impacts of this size happened about every 30 million years on Mars. Ancient Martian beaches would have been far from ideal for tropical resorts. "When imagining oceans on early Mars, don't picture Californian beaches, but instead a particularly cold and long winter in the Great Lakes," Fairén said. These findings may provide further evidence that ancient Mars could have supported life, the researchers said. "Cold, salty waters may offer a refuge for life in extreme environments, as the salts could help keep the water liquid," Fairén said in a statement. "If life existed on Mars, these icy tsunami lobes are very good candidates to search for biosignatures." The researchers are exploring the possibility that some tsunamis may have struck glacier-rimmed shores, "triggering the release of big ice chunks that would drift in coastal waters as wandering icebergs," Fairén said. "We have some preliminary evidence for such a process, so stay tuned." Future research will closely inspect other portions of Martian shorelines, looking for additional tsunami deposits, the researchers said. "We would like to characterize landing sites that will allow us to sample ice from the tsunami to investigate the original composition of the ocean," Rodriguez told Space.com. The scientists detailed their findings online May 19 in the journal Scientific Reports.